Reverend J Natural Beard Oil is a product made for guys who want a really manly beard in both appearance and smell. As a 100% natural product that was made entirely in the USA, it is exactly my type of product. The goal of any beard oil is to hydrate the hair and face. Initial impressions of this natural beard oil are great, but I am curious on how long time users feel about the product. This review will be your guide to Reverend J Natural Beard Oil’s pros and cons. By the end, you will have a pretty good idea if this is the right natural beard oil for you. Natural beard oils contain many of the same traits as one another. The ingredients used to determine the different attribute your beard oil will have, however. The ingredients used in Reverend J Natural Beard Oil are some of the best moisturizing natural oils available. They also happen to be some of the lighter feeling ingredients that are commonly used in natural beard oils. Using these lighter oils makes your beard feel soft but less greasy. Here are some of the specific ingredients. 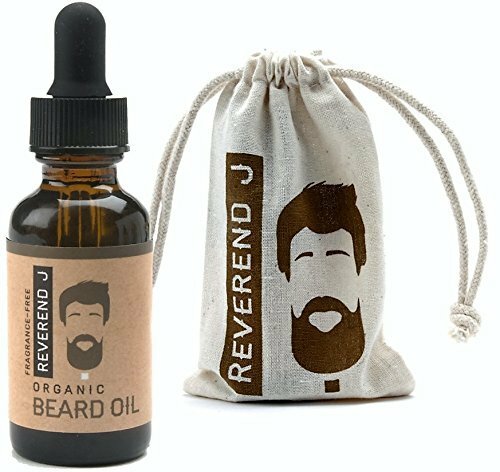 The other natural oils in Reverend J Natural Beard Oil serve to soften your beard and increase the hair's ability to retain nutrients. Natural beard oils are some of the most absorbent oils. They act like a leave-in conditioner and keep your beard feeling smooth and soft all day. Natural beard oils like Reverend J Natural Beard Oil are the best products for your beard and face. Beard oils that are not all natural contain silicone-based chemicals, which are dangerous for your hair Silicone based beard oils tend to coat the hair over time and leave a build up on each hair. This build-up leaves your hair seeming healthy, but in reality, your hair’s ability to absorb nutrients will be ever decreasing. Over time the beard will become brittle and thinner. Reverend J’s Natural Beard Oil is an organic product that has been produced entirely in the United States of America. All of the ingredients are great for hair nourishment and health while they also keep your hair soft and great smelling. Reverend J Natural Beard Oil has rave reviews on Amazon. It seems everyone is pretty impressed by the company’s customer service and the product itself. Most of the reviews discuss the smell of the product heavily. Any 4-star reviews usually comment that the smell just wasn’t what they expected. The smell is never stated as bad, in fact, it is usually praised. The cedar wood pine is the unanimous favorite, yet also the one that people say doesn’t meet expectations the most. It is because the cedar wood scent is so strong there is almost next to no pine scent. Others complain that the pine scent is way too strong. To me, that is a testament to the natural process that is used to make Reverend J Natural Beard Oil. Each batch is going to be a little different. There isn't much information online about the Reverend J Beard Oil company, but it does say that they are based out Cedar Crest, NM in the USA. On their website, it states that "Reverend J Beard Care products are made with the finest organic and essential oils to reduce beard itch, beardruff and split-ends. Regular use of Reverend J beard oils will contribute to a softer, healthier and better smelling beard." Some people have mentioned that they don't like the scent or that it's too strong for them to handle. However, others have said the smell doesn't last as long as they would like it to. When it comes to doing what it says, Reverend J Natural Beard Oil succeeds. No one complains of facial irritation or dandruff. Almost all the people who use this beard oil say that their beard is softer and smoother. The reviews are so overwhelmingly positive I felt a little overwhelmed trying to find critical things to say about the product. The most negative things that were said is that the scent doesn’t last very long or that some people don't like the smell. As with any natural beard oil, to get the scent to last it needs to be run through the entirety of the beard and combed onto the hair. This way it doesn’t become concentrated onto the location of application only. If the scent starts to fade, run a comb through your beard for a second and the scent will return if you have done the application correctly. Reverend J Natural Beard Oil is a great product that comes highly recommended by me and almost everyone else who has consistently used it. If you can enjoy the scent that you use, this is great natural beard oil. The price is very reasonable, and the one-ounce bottle will last a lot longer than you might think. I would recommend buying a bottle if you are just starting to grow a beard and need a good consistent natural beard oil. Or if you are looking for a manly, woods like the smell you should switch to the cedar wood pine scented Reverend J Natural Beard Oil. This product is great, but whether you buy it or not, always take care of your beard with a natural beard oil. Here are some top questions that I found for people seriously considering buying the Reverend J Natural Beard Oil. How would you describe the scent? It is very woodsy with a strong cedarwood scent.